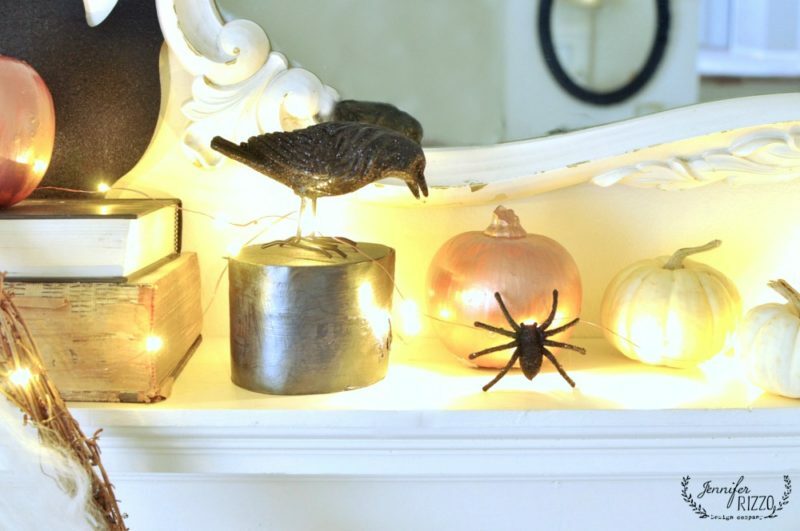 I have some fun Halloween mantel decor to share with you today! As a part of the Michaels Makers Challenge this month, they wanted us to have fun with their Halloween section and Boo it yourself! 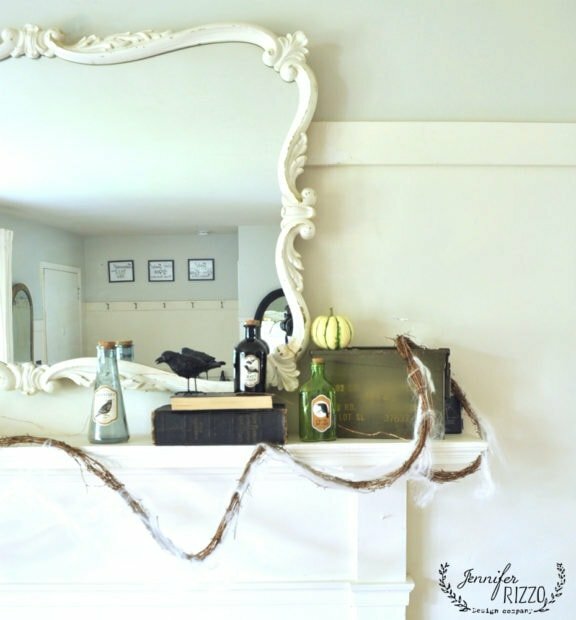 I decided to raid the aisle and have fun decorating my faux mantel. 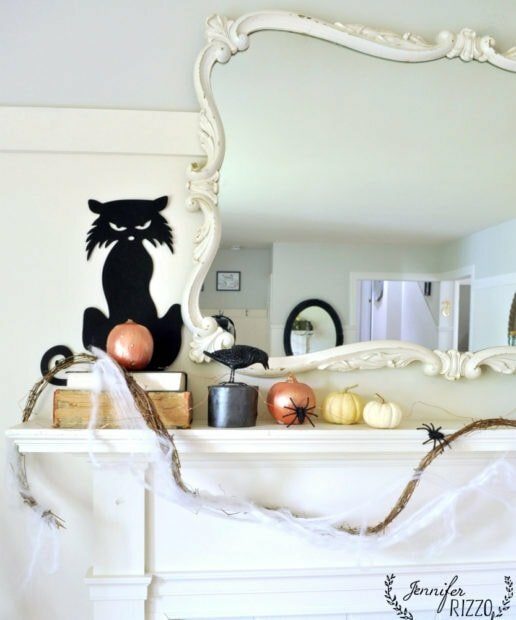 Or this one with a fun ghostly garland for Halloween mantel decor! As a decorating base,I started with grapevine wreath roll in the floral section and some faux spider webbing. I love how the grapevine has some naturally awkward twists and turns that lend very well to looking a bit creepy. 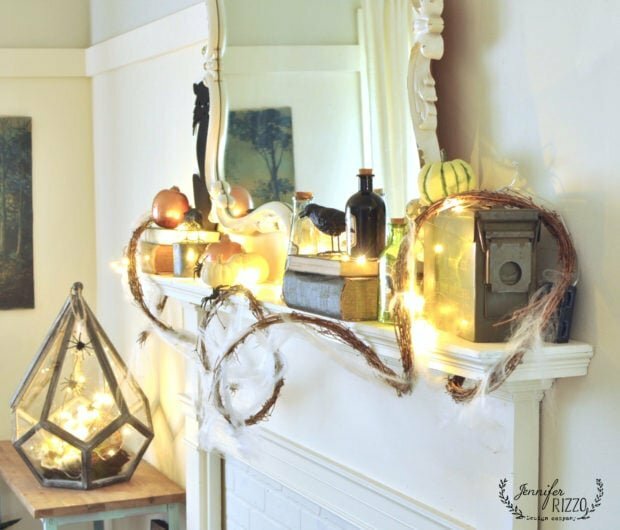 Layered with the spider webbing and the fairy lights, it looks really cool. 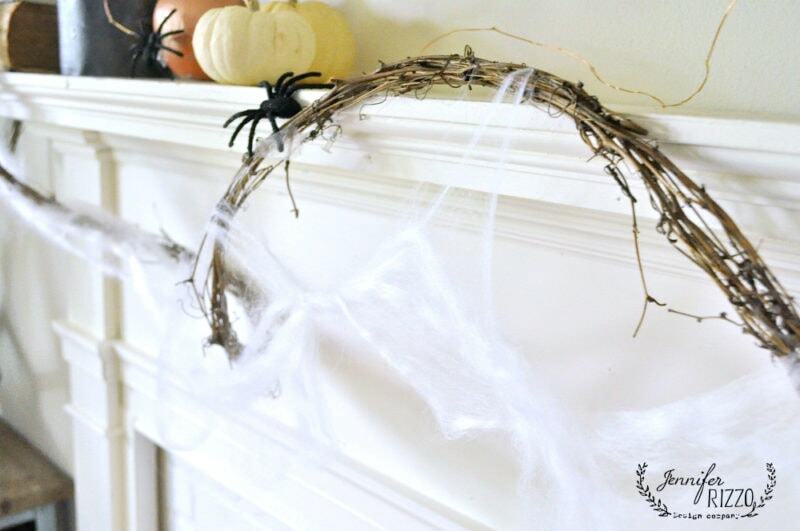 I even added a few faux spiders that may have crawled over from the little spider sanctuary I’ll share tomorrow. I love using books for height. These spooky book covers that I made a few years ago would have worked well. 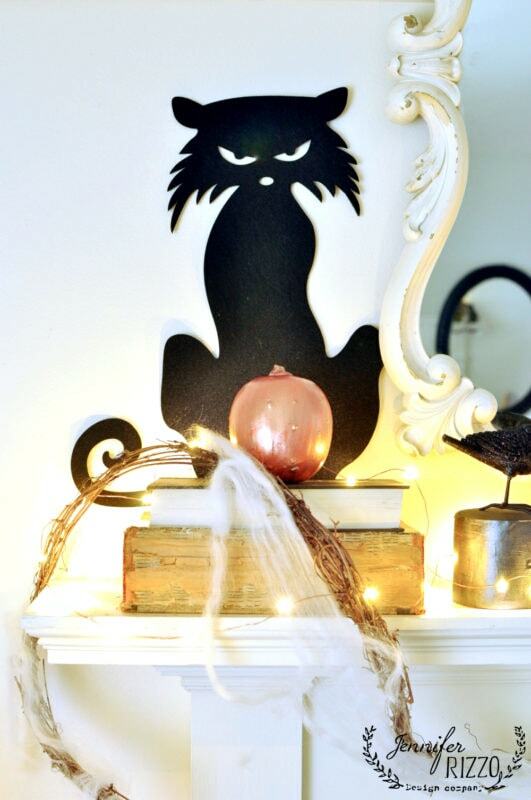 On the left side, I added a felt cat cut-out, and some vintage books, and copper painted pumpkins. There were other felt cut outs like bats there as well. Michaels also had these fun glittery crows,and I ended up getting two so I had one for each side. I really love how the fairy lights look, even during the day they add something extra! I used a gold metallic craft paint to paint a birch section from the wood section to use as a place for him to perch on. 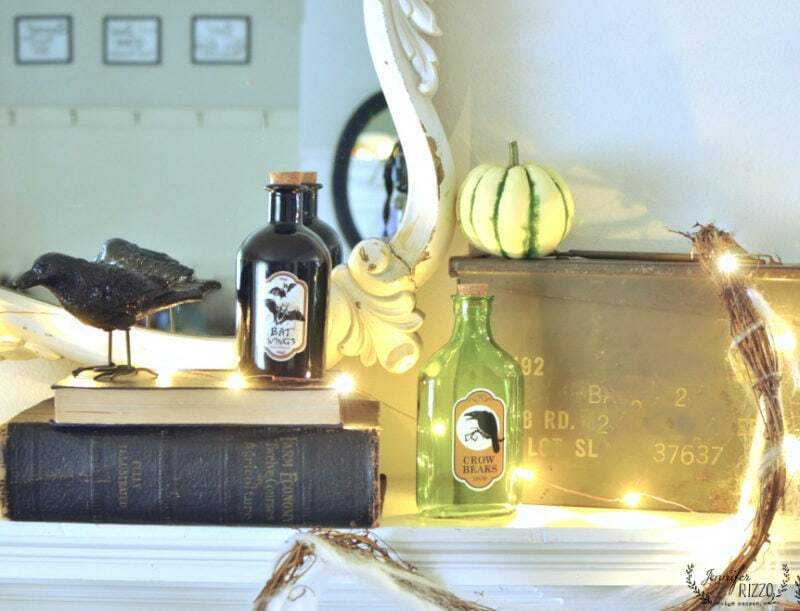 On the other side, I used a vintage metal box for height, and put the other crow and some cute glass bottles from the Halloween aisle. 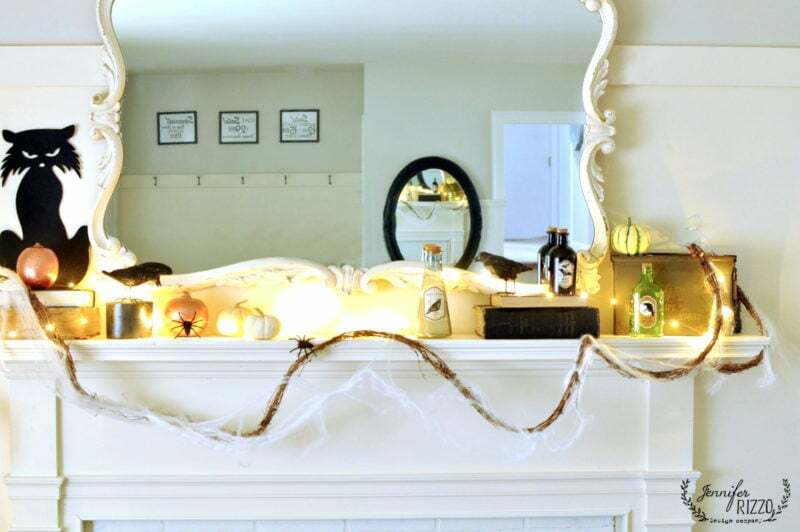 I like how the glass glows with the fairy lights behind them for Halloween mantel decor. 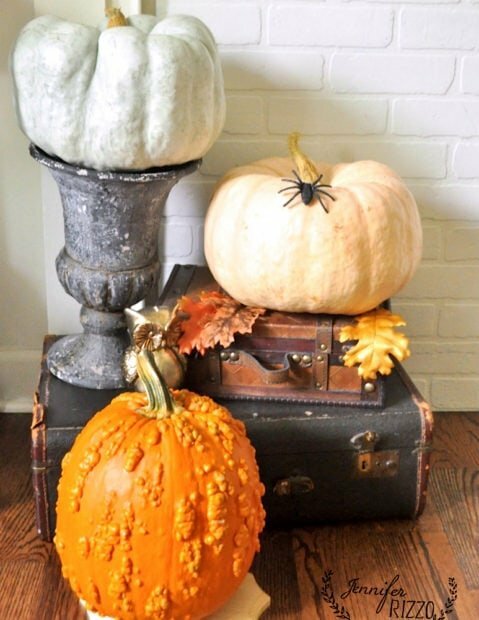 On the floor, I placed a trio of pumpkins on some vintage and new suitcases and a pumpkin on an urn for height. And the other side I placed lanterns with a few lanterns from the Halloween aisle. 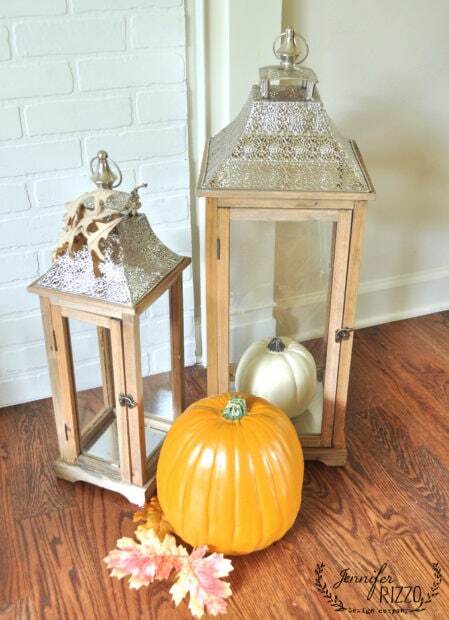 If you loved this Halloween mantel decorating idea, and whether you’re into spooky sights, playful pumpkins or giggling ghouls, Michaels is your Boo-It-Yourself Halloween Headquarters and has tons of ideas for DIY costumes and décor. So cute!! 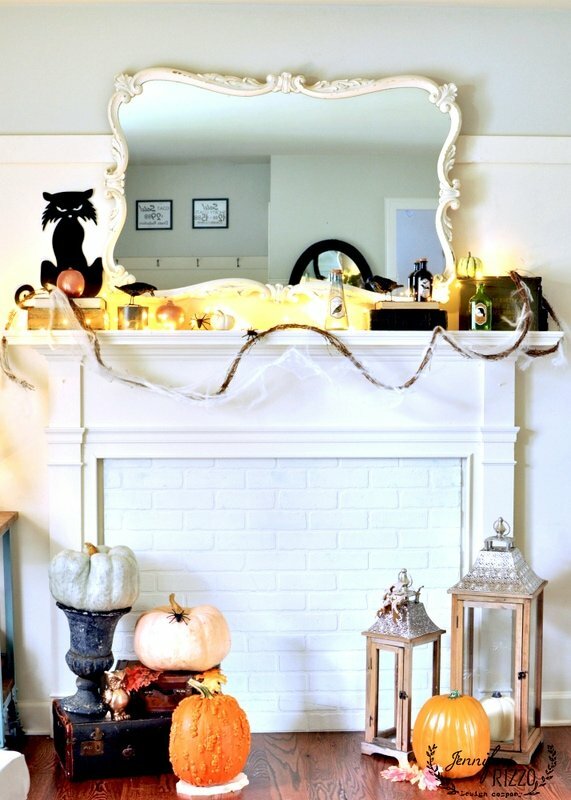 Where does one obtain a faux mantel? I want one so bad! Thanks Jillian! I have two since we don’t have a real fireplace. One was a road side find, 😉 and the other I bought at the flea market. It looks so cute, that pissed off looking cat is my favorite! :o) How do you become one of the Michael’s makers? Do you have to be invited? Thank you Tania. Micheals had reached out to me a few years ago about it.